We had guests over last night so I whipped up some strawberry shortcake to serve. 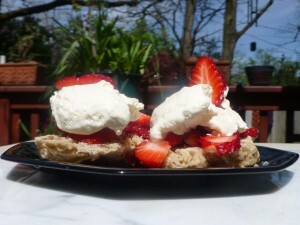 We had bought some early season strawberries the day before, then I made a pecan scone as the base. I topped it with freshly whipped cream. Delish. Nothing says that spring has arrived better than early strawberries. The strawberry plants in my yard are in full flower and I’m watching daily for signs of fruit. Spring is so exciting!